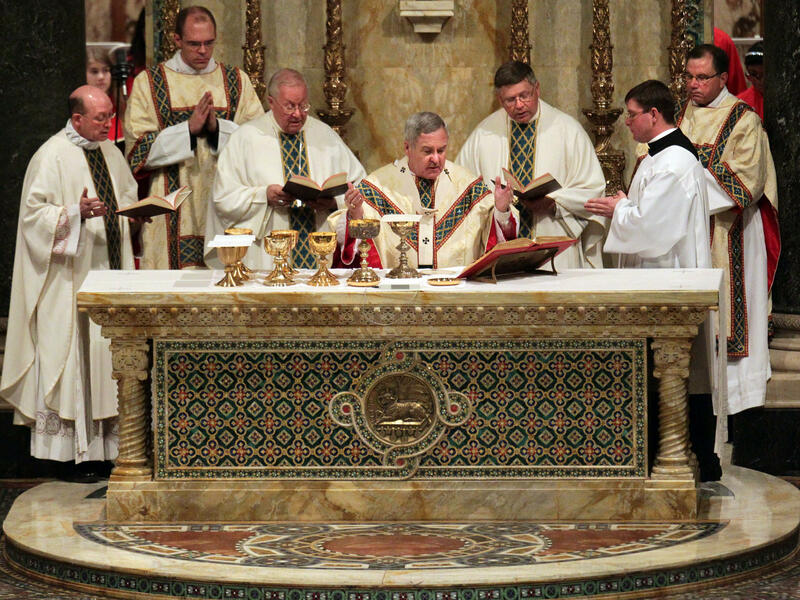 Archbishop Robert Carlson pictured at Cathedral Basilica on Saturday, Jan. 26, 2013, in St. Louis. On Thursday, he invited AG Josh Hawley to review church records and it's handling of sexual abuse allegations. The St. Louis Archdiocese is handing over its records to the state Attorney General's office for an investigation into the Missouri church's handling of sexual abuse accusations against clergy members. Archbishop Robert Carlson made the announcement that he was voluntarily opening church files at a press conference on Thursday. Carlson said he made the invitation to Attorney General Josh Hawley in a letter, adding that he was prompted by "several letters" he had received urging greater transparency. "Second," he said, "we have nothing to hide." The move by Carlson follows the recent release of a Pennsylvania grand jury report detailing decades of alleged sexual abuse by more than 300 priests and cover-ups by high-ranking clergy leaders. Carlson said Hawley will have "unfettered access" to the Archdiocese's comprehensive files. Among the records are files regarding more than a two dozen priests who have been removed from the church, Sandra Price, executive director of the Office of Child and Youth Protection for the Archdiocese, told reporters at the press conference. She confirmed 27 living priests have been removed from priestly ministry within the Archdiocese. She did not specify a time frame for the removals. Price added that there are no "priests serving in priestly ministry with substantiated or credible allegations of abuse" at this time. Some of the elderly priests who have been removed continue to live in church-owned facilities and receive a stipend, Carlson told reporters. Hawley said at a news conference that he took action in part because the statute of limitations could prevent charges being filed, as St. Louis Public Radio reports. He said his office so far hasn't received requests from other dioceses to review their files but that "we'll be reaching out to them." And Hawley noted that "his office can't subpoena specific dioceses, but added that his staff can investigate if they're asked," St. Louis Pubic Radio writes. "We'll be reaching out to them," he said. "I would strongly encourage them to do as the archbishop has done — and to open to us their files and their information. Make folks available to us so we can conduct an investigation that will cover the state and issue findings that will be comprehensive statewide." The Associate Press reported "representatives of the Diocese of Kansas City-St. Joseph and the Diocese of Jefferson City pledged cooperation with any investigation by the attorney general."